Info "I love snooping! Heh heh heh!" Suit of Armoire is one of Young Cricket’s Microgames in WarioWare: Smooth Moves. Its name is a pun on the phrase "suit of armor" and the word "armoire", another name for a wardrobe. 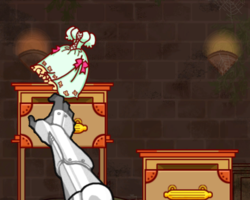 The player must watch several items as they go into drawers, with the drawers sometimes moving, and then find the item stated by the game. Some of the items include a knight's helmet, a dress, a ring, and a sword. 1st level of difficulty: There are two drawers. 2nd level of difficulty: There are three drawers. 3rd level of difficulty: Same as the second level, but the drawers shuffle around, sometimes faking movements. This page was last edited on February 19, 2018, at 19:14.